This page will provide you with information about peripheral nerve blocks for lower limbs. For further details, please speak to your consultant. 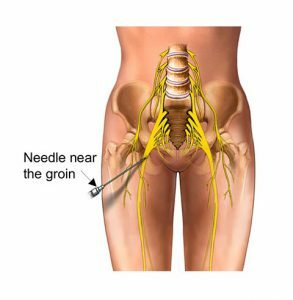 A peripheral nerve block is a type of regional anaesthetic that requires an injection of local anaesthetics and other painkillers near the major nerves to your leg. This will temporarily numb your nerves to give pain relief. A nerve block can be used for most people, usually giving a safe and effective form of pain management. The pain relief can last up to 18 hours. While a nerve block can be used before and during operations, it is mostly used for additional pain relief after the procedure. Depending on the type of surgical procedure you need, the injection may be given behind your thigh or knee, in your ankle or foot, or near your groin (see Figure 1). Guidance about where to make the anaesthetic injection is usually acquired by your anaesthetist using an ultrasound scanner and nerve stimulator. Having discovered the right site for the injection, the anaesthetist will guide the needle into the correct position and inject the anaesthetic. Occasionally the injection takes place through a small tube which can be left in place for further injections of anaesthetic. This procedure is suitable for most people to offer pain relief that is effective and safe during and after a procedure.